I remember going through my kitchen drawers and cabinets, pulling out appliances and thinking, “but what if I need that (rice cooker/dehydrator/coffee grinder) someday?” even though I had only used it once or twice years ago. I felt a little silly when I remembered how much I thought I really needed that item. Letting go of shoes that gave me blisters and made me walk funny was paralyzing because I had paid so much for them. I felt the shame of spending money I didn’t have to buy shoes I didn’t wear. I felt that shame each time I tried to wear the shoes, and every month when the credit card bills rolled in. When I finally went through my sentimental items including years of memory boxes, report cards from elementary school, concert ticket stubs, love letters, my daughter’s first bathing suit and countless photographs I felt guilty for not honoring those memories. Why were they stuck in boxes in the garage? 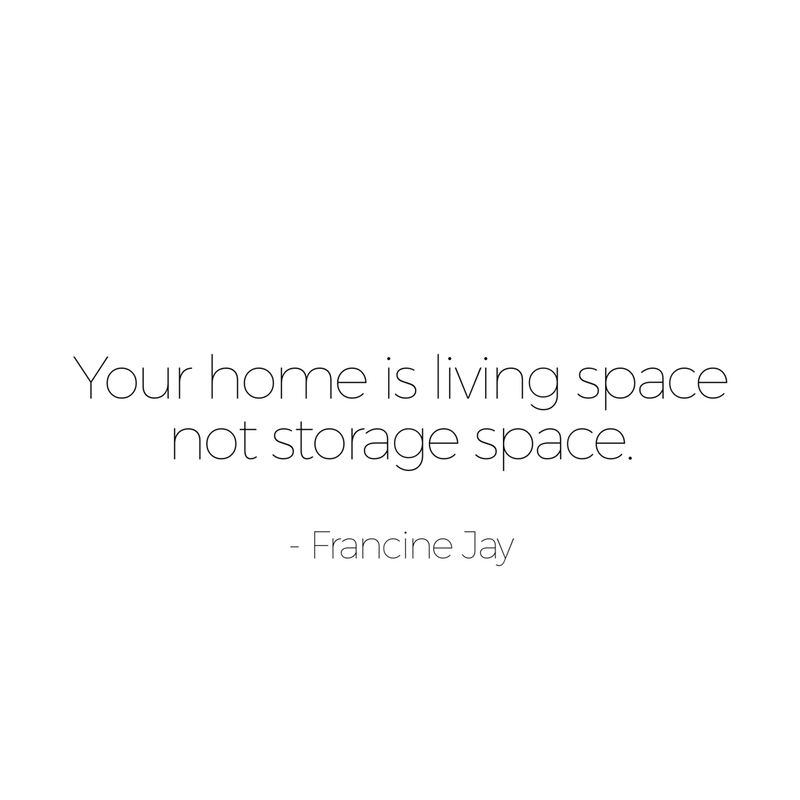 It’s usually not until we begin to clear clutter that we realize how connected to it we are. We don’t understand how much power our stuff has over us until we let it go. I felt silliness, shame, or guilt around my clutter before I let it go, but the stuff itself distracted me from connecting the dots. I didn’t understand that I felt bad on the inside because of the stuff on the outside. If I felt too bad, I’d just buy more stuff to feel better. And then I’d hold on again … with my time, attention, money and emotions. When I finally let go of the stuff, I felt the feelings attached one last time and then let them go too. Now I have more space on the outside and the inside. In A Simple Year, the year-long course beginning January 2nd we start with clutter too. It’s how we make space to look at the other topics because we aren’t just making space on the outside, but the inside too. Simplicity author, Brooke McAlary teaches us how to clear clutter in the first module. She offers room-by-room checklists and downloadable labels too for the boxes you’ll be filling as you clear clutter from your home and your heart. Many members continue to work on their clutter throughout the year, but they create a solid foundation in that first month to look at each topic with more clarity. From there we move on to simplifying busyness, digital clutter, cooking, travel, mindfulness, money, self-care, relationships, eating, gifts, and gratitude. With 12 months of guided simplicity, you can decide how best to invest your time. 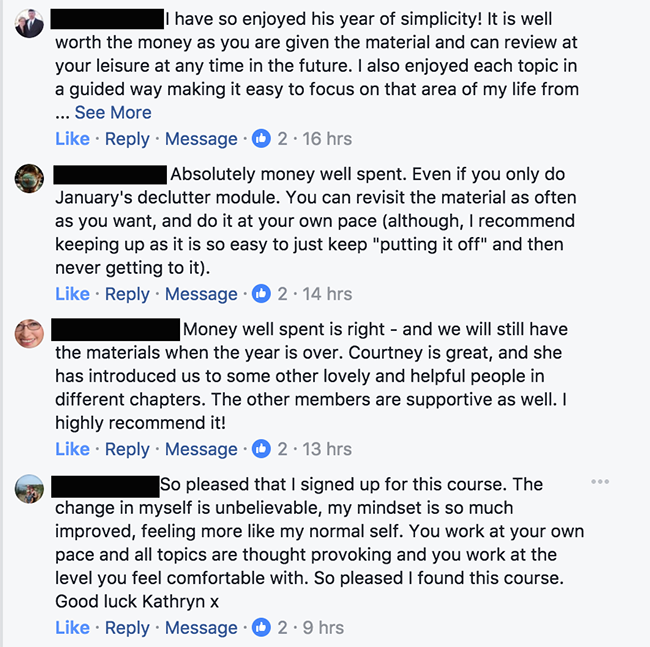 I’m in the UK, can I do the Simple Year course next year? Sure! People participate from all over the world. For me the worst thing is buying something thinking that at one point in time, it will save me money because I will have this. But the only problem is when I need it, I can’t find it due to all the clutter, therefore I have to go out and buy what it is I need. Clutter creates another vicious cycle of its own.